Groundfish in Alaska are caught as part of a multi-species fishery. Out of the 43 species/gear combinations, only 1 was found to be unsustainable: shortspine thornyhead caught by bottom trawl. This species is covered in a separate report. Alaskan groundfish are exported worldwide. Management of a multi-species fishery can be challenging. However in this case, management is excellent as regular stock-assessments are performed with up-to-date assessments available, and regulations exist regarding biological reference points, harvest control rules, and incorporation of uncertainty when determining catch limits. Much information is available on stock status, and data indicates that populations are healthy. The groundfish are fished at a sustainable rate. Some non-targeted species caught in the Alaskan groundfish fishery include: steller sea lions, giant grenadiers, killer whales, starry flounders, tanner crabs, snow crabs, Pacific sleeper sharks, longnose skates, spiny dogfish, northern fulmar, atka mackerel, sharpchin rockfish, harlequin rockfish, black-footed albatross, laysan albatross, and Pacific halibut. Amongst these species include those whose stock status is of concern, whose inherent vulnerability to fishing pressure is high, or whose fishing mortality rates are high. Bottom trawls have the potential to cause large amounts of habitat damage due to the fact that they drag across the ocean floor. Although longlines, pots, and jigs are immobile gear types, they nevertheless make contact with the ocean floor and have the potential to cause damage. In order to mitigate these impacts, a number of regulations including spatial restrictions are in place. 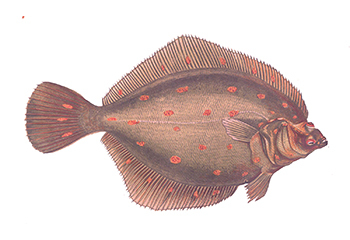 During the early 1900’s, industrialization and improvements in fishing techniques facilitated the exploitation of the American plaice population. Consumer demand increased with time, with overfishing continuing well into the 1960’s. Peak fishing pressure occurred in the 1990’s, and focused on a fish population that was now decimated and at an all-time low. The population is currently recovering, and data predicts that the stock will be rebuilt by 2056. Although management has at times been poor in the past, recent modifications to regulations have established stricter limits on catches. This new management regime is considered to be moderately effective. Management plans to minimize bycatch exist, although these could be improved upon for greater effectiveness. The life history characteristics of American plaice make it highly vulnerable to fishing pressure. Since the stock has been overfished, the population’s abundance is at a low level but is currently rebuilding. The use of otter trawls has a significant impact on the bycatch of Atlantic white-sided dolphins; a species which is already overfished and whose low population numbers are of concern. Otter trawls have the potential to severely damage the habitat by increasing the turbidity in the water, smoothing the substrate, causing mortality or injuries to species, and by destroying the habitat. The effects of removing American plaice from the ecosystem are not well understood. North Sea, Skagerrak & Kattegat, FAO statistical area 27, ICES Area IV, Division IIIa.